This week four tenants in Leeds took their landlord to court and won their rent back. Here's how they did it - and how you could too. 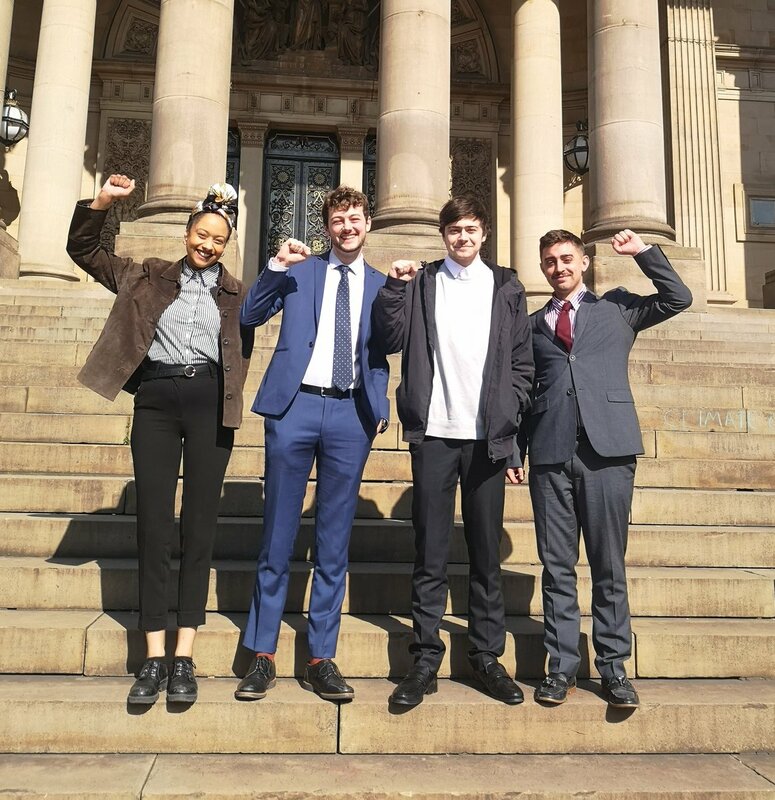 Sophie Flinders, Charlie Hind, Isaac Parker, Ben Leonard and Paige Murphy (not pictured) after winning their court case. The disgraceful state of this country’s private rental housing market is no secret. At best, people in the UK can expect to pay some of the most expensive rents in Europe. At worst, they can become victims of slum landlords who allow their properties to fall into obscene states of disrepair, and harass and illegally evict tenants for having the temerity to ask for a home fit for human habitation. Renters often feel powerless in the face of mistreatment and unlawful behaviour from landlords – but they don’t need to. On Thursday, 29th March 2019 we took our former landlord to court and won most of our rent back under a Rent Repayment Order (RRO). An RRO allows a tenant or local authority to reclaim rent or housing benefit where a landlord rents out an unlicenced property, and is pursued through the First-tier Tribunal (Property Chamber) under Section 43 of the Housing and Planning Act 2016. This has been a severely underutilised piece of legislation – the Residential Landlord’s Association found that 89% of local authorities had not used the powers granted by it between April 2017 (when it came into effect) and the end of 2018. Our case was far less harrowing than the situations many people find themselves in. Our landlord had failed to acquire a house in multiple occupation (HMO) licence, which any rented property in England and Wales is required to have if five or more unrelated occupants (fewer in some local authorities) are sharing facilities. The licence is granted if a property is suitable for the number of occupants, has safety certificates for gas and electrical appliances, is fire-safe, and is managed by someone considered to be ‘fit and proper’. We were awarded our rent back because the property was unlawfully let, but there are several other grounds for a RRO such as harassment, illegal eviction or failure to comply with an improvement notice. It’s easy to find out if you’re living in an unlicensed HMO in a matter of minutes by checking your local council’s public HMO register. If you find that your house doesn’t have the necessary license, contact your council’s housing officers for advice on how to proceed, and apply for a Rent Repayment Order through your region’s First-tier Tribunal (Property Chamber), who can also offer advice and support. Under neoliberalism, the housing market has become a lucrative investment opportunity, with devastating effects for those who rely on it for their basic needs. For too many landlords, tenants are a quick money maker, while the real people who live in their properties are a necessary inconvenience at best. Many property managers aren’t willing to put in the time or money to maintain their properties to a liveable standard or – as in our case – even get them licenced. We managed to win this case with the help of our local authority housing officers, but the best way to fight rip-off landlords is through our collective strength and solidarity. Branches of ACORN – a community-based, housing-focused union – are springing up across the country. They currently have groups in south Belfast, Birmingham, Bristol, Brighton, Manchester, Sheffield and Newcastle, with others on the way, including here in Leeds. Scroll through ACORN’s social media feeds and you’ll find case after case of people coming together to demand that they are treated with respect – and winning. Remarkably, our victory this week was only the second Rent Repayment Order in Leeds. We hope this case inspires more people to learn their rights, take matters into their own hands, fight rule-breaking landlords and – most importantly – join a tenants’ union like ACORN. Sophie Flinders works for the NHS, is a member of Momentum and the Racial Justice Network, and is the youth representative for her Unison branch. Ben Leonard is studying for an Msc in Inequalities and Social Science at the University of Leeds and is a committee member of Leeds Momentum.